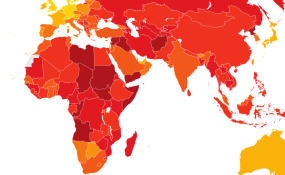 Africa: Sub-Saharan Africa Needs to "Take the Corruption Bull By the Horns"
Perceptions of corruption across Africa: The darker the red, the more corrupt a country is perceived to be, with those marked in yellow hues judged less corrupt. Sub-Saharan Africa is struggling to curb corruption but some countries have found the right 'ingredients,' to do so, Transparency International's coordinator for West Africa, Samuel Kaninda, tells DW. Transparency International's Corruption Perceptions Index 2018 puts sub-Saharan Africa as the lowest scoring region. With an average score of just 32, the region is far from the world average of 43 points in its struggle to control corruption. But not all African countries rate badly. Sudan increased its score and is listed as one of the "improvers" on the 2018 index. DW: What has caused sub-Saharan Africa to do so badly on the Corruption Perceptions Index? Samuel Kaninda: The score of sub-Saharan Africa has been consistently poor. It has probably been the poorest performing region of the world. That is because the anti-corruption institutions are there, the laws are there, but these laws and these policies are not effectively implemented or enforced. So there is a deficit of political will and leadership to really bring change and take the corruption bull by the horns. Countries like Senegal and Ivory Coast gained quite a few points this year. Senegal moved from 36 points in 2012 to 45 points in 2018. That's two points above the world's average. What is Senegal doing right? The period of improvement of Senegal goes back to 2012, when the citizens of the country elected their new leader, President Macky Sall. After Sall was elected, Senegal took a few decisions and steps in the right direction. There was a new anti-corruption institution that was established and there was one which deals with fraud as well. There are a number of laws, including one on the declaration which promotes transparency. There is a court that focuses specifically on illicit enrichment and there's a number of other steps that have changed the perception of experts and citizens in terms of the government's seriousness to deal with the issue. Is having good leaders across sub-Saharan Africa all it takes? I'm coupling that with the issue of political will. There needs to be a will to deal decisively with the issue of corruption. Many of the countries in Africa, almost 40 out of the 55, have ratified the African Convention on Preventing and Combating Corruption. With that, you have many who have established anti-corruption agencies. But you can have those laws and those agencies, but if the agencies are not well resourced, if they are not independent from political interference for cases that they need to investigate, then the situation will not change. It will remain like a smokescreen but no substantial change will happen. And that is what is reflected in the poor performance of this region of the world on the Corruption Perceptions Index. What needs to be done for sub-Saharan African countries to increase their points? In the fight against corruption we need transparency to know in which way institutions operate and to allow citizens and those with differing views to be able to demand accountability. We need to bring those who are alleged to have committed acts of corruption before court, regardless of their political or social status. In many cases you would see that especially the justice system is not really free from political interference. Not all cases will find their day before the court. And that also perpetuates corruption because those who would want to engage in those acts of corruption would know that they would get off scot free, provided they are well-connected politically. So impunity is one thing that needs to be addressed and also to protect those who blow the whistle, those who denounce acts of corruption, and I would include journalists and political opponents. Most countries that scored low did so due to ongoing political crisis, though they have relatively well functioning democratic and governance systems. What is the excuse? The excuse is again the political leadership. If you look at countries like South Africa: there are reports of a lot of corruption, both systemic and the political elite colluding with business interests. But the good thing to note there is that the media is able to report this freely. There may be threats but the justice system is able to take this up. We have commissions that have been established and the new administration has been able to stamp its authority on the issue of corruption. Countries with strong democratic institutions are able to deal with the issue of corruption because the rule of law is key. The judiciary does its work, the investigative institutions are doing the same. And civil society is also free to do its work. A combination of all these ingredients would be needed both in countries that are more advanced in terms of democracy but also in the ones that are struggling there. It's really foundational work that needs to be done. Firstly to set up and strengthen those institutions and to make sure that people have their voices, regardless of whether they share the opinion of the ruling party elite or coalition or not. All those points I think need to be upheld and put together to bring corruption under control, if not eradicate it. What seems to be the future for sub-Saharan Africa? The future depends on our own state, the people but also the leaders. The African Union declared last year as the African Year of Anti-Corruption and correctly saw the theme was: "Winning the Fight against Corruption: A Sustainable Path to Africa's Transformation." That in itself is an expression of the recognition that corruption is an issue. Political leaders, our administrative institutions, the business sector and citizens, all of us need to come together to be able to challenge and to speak up against corruption and to be able to act against it. I think those are the things that we would promote, in order to see some notable and tangible change in terms of the corruption situation. And that would mean that Africa, which is a resource-rich continent, not only in terms of minerals but as the most youthful continent, would be able to enjoy the benefits of having all those resources and advance its own socio economic development agenda. There are also countries in Europe and Central Asia that scored low on the index. Is there a difference between these countries and African countries? Corruption is a global issue. So even countries like Denmark or New Zealand which have had the top score on the index are not free from corruption. But it's more about the strength of their institutions to be able to deal with corruption, both from a preventive point of view but also addressing cases of corruption through the justice system. We've seen that the US superpower is falling below the top 20 countries. This shows that it has also a lot to do with the way the political elite engages itself because we define corruption beyond the financial aspect of it. So the minute a person or an institution abuses its power or other agendas that are different from the general good, it already gets into corruption. It is true that we are seeing the rise of populism here and there, and leaders will use themes that would hook citizens to get into office. But once they get into office, even on an anti-corruption agenda, they don't deliver. And we are seeing that once socio economic challenges catch up with people in those countries, especially established democracies, people can express themselves, they can take to the streets. So corruption remains a global issue and anywhere in the world if the recipe that we talk about is not really applied you are bound to see your perceptions or even your corruption fights going south. This interview was conducted by Eddy Micah Jr. Copyright © 2019 Deutsche Welle. All rights reserved. Distributed by AllAfrica Global Media (allAfrica.com). To contact the copyright holder directly for corrections — or for permission to republish or make other authorized use of this material, click here. Africa: Explainer - What Is Quantum Machine Learning and How Can It Help Us? Africa: Women in Stem - Trudy Morgan, the First African Woman Fellow of the Institution of Civil Engineers of the UK. Where and How Far Could Artificial Intelligence Take Africa? Who Will Be Held Responsible for Xenophobia in South Africa? Report of Gaddafi Fortune in South Africa Just a 'Ghost Story'? Kenya: A Third Gender for the Country? Africa: Is Jumia's IPO Setting the Stage for More African Startups?